Loss of habitat due to construction of infrastructure and urbanisation, hunting, nest plundering, electrocution, and disturbances caused by human activities (climbing, sport fishing, etc.). 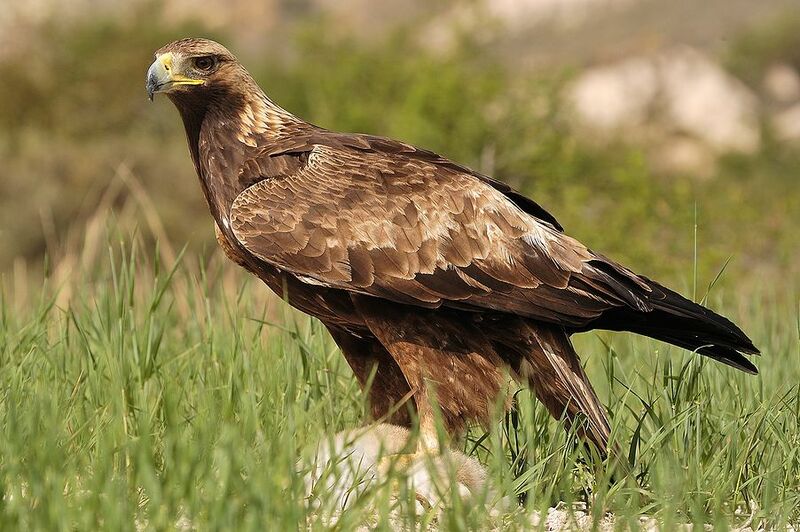 Identification: Large bird of prey and the largest of all Iberian Peninsula eagles. Its plumage is dark brown with golden tones on its wings, head and neck; in flight, it appears to have rounded wings that become narrower near the axillas, a long tail, and a brown colour with the flight feathers and tail being lighter. Juveniles are very dark with white spots on their wings and tail, and the latter also has a dark band. After 5-6 years they acquire adult plumage. Song: Silent; sometimes it makes a soft whistle. Diet: Its diet is very diverse: mammals such as rabbits and hares, birds such as partridges and pigeons, reptiles such as lizards and sometimes snakes, and it also eats carrion sometimes. Reproduction: The breeding cycle begins with the courtship display, at the end of January. It nests in rocks at a high altitude (up to more than 2,000 metres), although some pairs may nest in trees. The nest is solid, built by both adults although the female does most of the work, and is made of branches and covered with grass and wool. Eggs are laid between mid-February and March, the only the female is involved in incubating them. The chicks are constantly supervised and cared for by the mother. It inhabits mountainous areas with rocky ledges where it can nest, although it sometimes also occupies flatter areas with little vegetaion where it can hunt. In Spain: It is distributed throughout the principal mountain systems of the peninsula. In Castile and León: The principal populations are found in the mountains and hills of Burgos, Soria, Ávila and León, and in river ravines in the southwestern Duero basin, and in Zamora and Salamanca. Movements and migrations: Only juveniles and immature specimens make dispersive movements. In Spain: There is an estimated population of more than 1400 breeding pairs (2003 data). 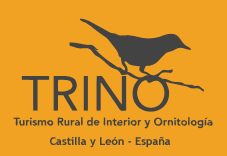 In Castile and León: There is an estimated population of 200-300 breeding pairs.